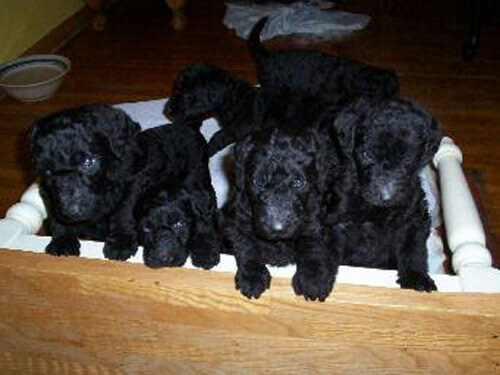 The Airedoodle, a cross between an Airedale Terrier and a Standard Poodle, is a larger sized hybrid dog. They tend to more closely resemble the Airedale, however the Poodle characteristics are also visible. Generally, like with most hybrid breeds with Poodle in the mix, the Airedoodle is low shedding, however they still need routine grooming to remove dead hair and dirt from the coat. Owners may choose to clip the coat to keep grooming to a minimum. The coat is medium long and curly to wavy, coarse to soft in texture and found in a variety of colors. Options for the coat colors range from the black or grizzle with tan to apricots, browns and even cream colors. The head of the Airedoodle tends to be somewhat flat and rectangular in shape with a longer muzzle, deep set dark eyes and longer, pendant ears. The face is covered with longer, curly hair and the dogs may have a beard and highly noticeable eyebrows. The neck is long and mobile and the chest and shoulders are well developed yet proportionate. The body tends to be long and lean, highly streamlined and athletic looking. The legs are long and straight and the longer, tapered tail is carried high. As with any of the terrier cross dog types, the Airedoodle is very active all through life but can be extremely active as a puppy. Since they are a larger dog, maturing at between 40 and 50 pounds or more, they do need obedience training and socialization from an early age. Some Airedoodles will be prone to chasing and may have a moderate to very high prey drive. If there are cats in the house the puppies have to be raised with the cats and actively socialized to prevent chasing and aggression. Generally the Airedoodle is a very friendly dog and gets along well with other dogs and children. They love being around people and are natural clowns and very playful. Some may be somewhat dominant but consistent, firm, positive training is all that is required to manage these dogs. They are ideal for active families and homes with large, fenced yards. Airedoodles are also great as country dogs but do not do well in small, confined living spaces. Kennels and small apartments are not appropriate for this dog unless they will have several hours of exercise and human interaction per day.